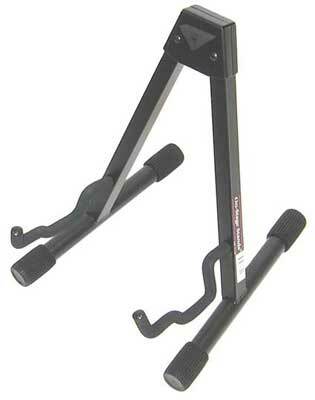 An affordably priced A-Frame guitar stand for electric or acoustic guitars. 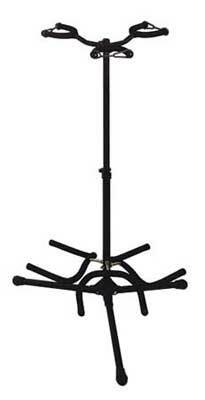 This stand features a lightweight design, black velveteen rubber and OnStage's patented double-stepped yoke. It can also be used as a desktop mixer stand. Black finish. On Stage A Frame Guitar Stand Features Flush end caps to protect your instrument Black velveteen rubber Matte black powder coat finish 1 inch x 1 inch square tubing Stepped yoke for gravity-assisted stability Non-slip end cap feet On Stage Stands For nearly 20 years, The Music People! Inc. has been on of the nation's leading suppliers of microphones and pro audio equipment. The Music People! Inc. also owns and manufactures On-Stage Stands support stands. Founded on a promise of quality, innovation and customer service, The Music People! Inc. is committed to the needs of music professionals throughout the world. 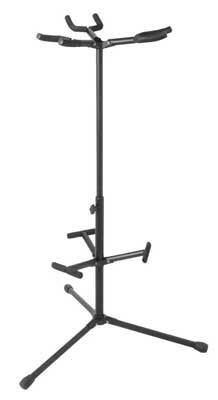 Constructed of all metal, the On Stage 7352B Heavy Duty Triple Guitar Stand is sturdy enough for any guitar or bass. These black tubular stands prevent needless damage to your guitar or bass and keep it within reach by using one of these heavy duty guitar stands. Loaded with features, the Tri is designed with three long legs to provide extremely stable support on a variety of irregular surfaces. This is an outstanding all-purpose stand which packs high-end features into an affordable package -- a great choice for the entire guitar collection or showroom! Black scratch resistant finish for years of use. On Stage 7352B Heavy Duty Triple Guitar Stand Features Flush end caps to protect your instrument Security strap Black velveteen rubber Matte black powder coat finish 19mm tubing (top section) V-Groove in rear of top section for easier assembly and confident setup Stepped yoke for gravity-assisted stability Rolled edge of bottom section for easy setup Non-scratching friction knob 22mm tubing (bottom section) Solid steel rod with keyway Heavy-duty Die-cast leg housing Non-slip end cap feet. The On Stage Hang-It triple guitar stand offers users a way to hang most standard guitars by their headstock. The Hang-It stands feature a tripod base and are height adjustable to accommodate electric, acoustic and bass guitars, as well as banjos and mandolins.